Perfertti had been founded in the town of Latinate, Italy, in 1946, by brothers Ambriogio and Egidio Perfetti. The brothers initially called their company Dcoificio Lombardo, and the small company began producing candies and confectionery for the near by market in Milan. The Perfetti grew quickly, expanding their factory into the 1950s. The product that put the perfetti name on the international candy map launched soon after the company’s founding. The arrival of the American army in Italy during World War II had introduced Italians to a novel new confectionery-chewing gum. The company later changed its name to Perfetti. In the 1960s, the company incorporated; 1900 as van melle; 1946 as Dolcifico Lambardo; 2001 as Perfetti Van Melle. Perfetti Van Melle S. P. A. is the world’s sixth- largest candy and confectionery producer and number two in Europe. Representing the combination of Italy’s perfetti with Netherlands’ Van Melle, Perfetti Van Melle produces and markets a host of top- selling candy brands, including Mentos, Fruitella, Brooklyn, Alpenlive, Golia, and Frisk. Perfetti Van Melle has a worldwide presence, with factories in Italy, the Netherlands, Germany, Spain, and elsewhere in Europe, as well as manufacturing sites in the United States, Brazil, Turkey, India, China, Indonesia and Vietnam. Perfetti Van melle India Private Ltd Profile. (Chennai Factory) founded in 2001. Construction of the manufacturing unit situated at Karanipuducherry Village and Post, Chennai, Tamil Nadu State. The industrial effluent stream is collected in collection tank of 180 kL (Kilolitres) capacity and them giving even mixing by aeration from where it is transferred into a flocculation tank. In the flocculation tank, alum and polyelectrolyte are added so that all the inorganic substances in the effluent water are coagulated and made into thick flocs. The sediments thus formed are removed by passing through an inclined plate clarifier. Then the remaining water sends it to DAF (Dissolved air floccation) for separating oil scum. After DAF treatment wastewaters, send it to air equalization tank for maintaining pH at 7 by adding caustic. This waste water transfer to buffering tank and added known amount of caustic, bicarbonates, cobalt, nickel and ferric chloride for increases pH and maintaining around pH 7.75. This buffering tank wastewater pumped to anaerobic chamber II and I for digest organic materials, after anaerobic treatment treated effluent and the sewage effluent (collected separately in an equalization tank of 15 Cu.M. capacity) pumped into the aeration tank. Constant aeration and mixing is employed to make the contents homogeneous. The biological activity taking place in the aeration tank converts the organic load into carbon dioxide and linked to pre-aeration tank and giving proper mixing for sledge settling inside the tank. Then the over flow pure water again pump it to second clarifier (recycling) overflowing from the inclined plate clarifier is allowed to pass on to the aeration tank. After clarifier, this water filtered by sand filtration technique and stored into open tank for evaporation. The characteristic raw effluent produced by this confectionery industry are characterized by their organic content; most are composed of easily biodegradable compounds such as sugars, sweeteners, casein, vegetable oils, acacia gums, condensed milk, food coloring and flavoring agents, etc. This confectionery industry using major ingredients such as sugar and sweeteners, natural colors, acacia gum, sugar substitutes, gum base and flavors for all type of confectionery products. They use number chemicals during the process and they all become a part of the effluent. This liquid effluent is acidic in pH, dominated by yeast cell population. Algal Technology for pH correction: VIAT has developed an algae based pH correction technology which is now being followed in Perfetti van Melle, Chennai. Algal treatment not only corrects pH but also removes sugars and other salts thereby reducing the TDS and nutrient load. 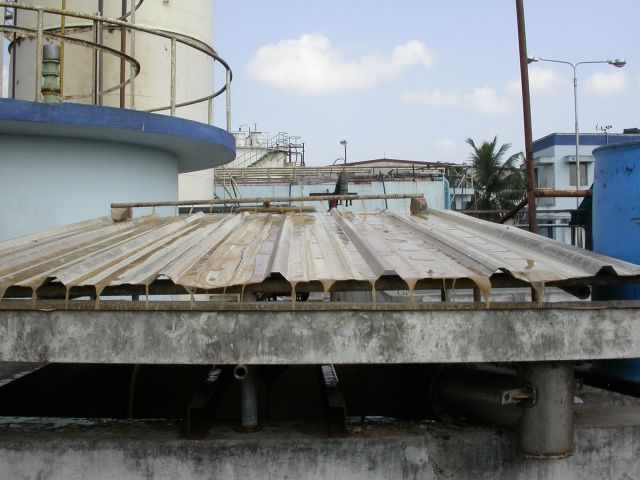 This reduces the load for the RO plant thereby extending the life of the RO membrane. The industry is able to save lot of money on NAOH and reduced salt load and sludge formation makes the effluent highly manageable.